The 1991 Soviet internet helped stop a coup and spread a message of freedom. 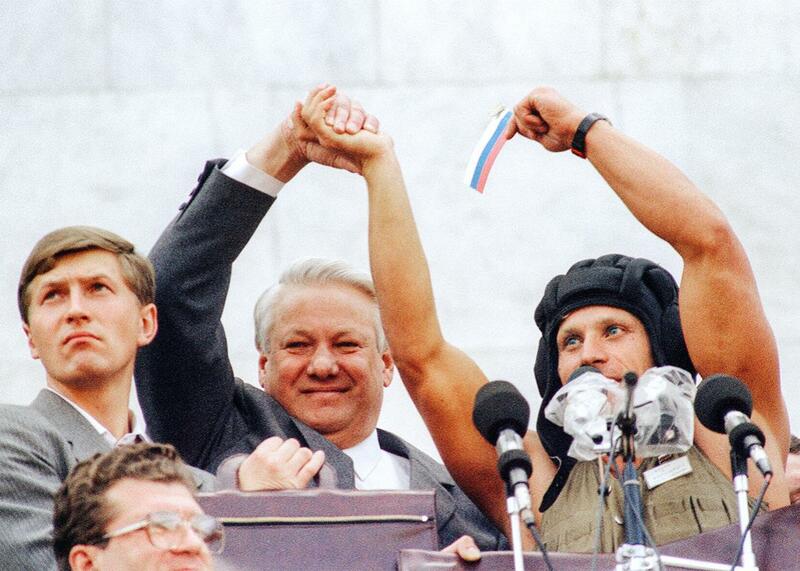 Russian President Boris Yeltsin shaking hands with an unidentified tank crew member as supporters turned out to celebrate the collapse of the three-day coup in 1991. This essay is adapted from The Red Web: The Struggle Between Russia’s Digital Dictators and the New Online Revolutionaries, by Andrei Soldatov and Irina Borogan, published by PublicAffairs. Early in the morning on Aug. 19, 1991, a phone call woke Valery Bardin at home. A journalist friend said he had heard, from Japanese contacts, of an attempted coup against President Mikhail Gorbachev. The news about the putsch broke first in the Far East, then rolled westward across the time zones before hitting Moscow. Hours after the announcement was first broadcast in the Far East, it aired on television in Moscow. Valery Bardin was a head of a bunch of programmers of the very first Soviet internet service provider, known then as Demos/Relcom. The first Soviet connection to the global internet was made almost exactly a year before, on Aug. 28, 1990, when programmers at the Kurchatov Institute, the main nuclear research facility in the Soviet Union and home to the team of programmers working with UNIX (the Russian version was known as DEMOS, an acronym for the Russian words meaning “dialogue united mobile operating system”), exchanged emails with a university in Helsinki,. The programmers had already established connections with research centers in Dubna, Serpukhov, and Novosibirsk. The network used telephone lines, and the bandwidth was extremely narrow—the network was capable only of exchanging simple emails. They named their network Relcom (from English—RELiable COMmunications). The core of the network was based in the Computation Center of the Kurchatov Institute, led by Alexey Soldatov—Andrei’s father. By the summer of 1991, Relcom had a leased line to Helsinki, and the internal Soviet network had reached 70 cities, with more than 400 organizations using it, including universities, research institutes, stock and commodity exchanges, high schools, and government agencies. Technically Relcom had two headquarters. There were a few rooms on the third floor at the Computation Center at the Kurchatov Institute, which housed the main server built on the IBM 386 personal computer. Modems at 9,600 bits per second were permanently connected to the international phone line. The other headquarters was located in the nondescript mansion on the Moscow River embankment, with the second floor housing the team of 14 Demos programmers working night and day repairing and improving software and maintaining the network. They also had a backup server and a 9,600-baud modem. Bardin’s first reaction was to check the group’s server from home. There was no connection. He went out to buy cigarettes. On his way he met a friend and colleague from Leningrad (now St. Petersburg), Dmitry Burkov. Together they rushed to the Demos building, knowing there was always someone sitting there, day and night. They saw tanks on the streets of Moscow. Around 7 a.m., on the orders of the defense minister, Dmitry Yazov, who had joined the coup plotters, tank units began moving into the city along parachute regiments in armored troop carriers. Strict censorship was imposed on the news media. State television introduced Gennady Yanayev, a Soviet vice president and gray, unremarkable figure, as the new leader of the country. In fact, Yanayev was given this role only to make the ousting of Gorbachev look more legitimate. The real mastermind was Vladimir Kryuchkov, chairman of the KGB, and the KGB had a prime role in orchestrating the coup. KGB special operations forces were dispatched to Crimea, where Gorbachev was on vacation. The KGB cut off Gorbachev’s personal phone line from his vacation compound, then the local phone lines. He was totally isolated. By coincidence, the putsch began on the opening day of a Moscow computer expo. The nascent business of Relcom/Demos had a stand at the show, and some programmers were milling about there. The first thing Bardin did when he arrived at the Demos two-story building was to call the expo and order everyone to return to the office as quickly as possible with their equipment. The network connection had been off because of technical problems, but it was soon restored. As chief of the team based at the Demos building, Bardin took over. That day Alexey Soldatov, head of the Kurchatov office, was far out of town, in Vladikavkaz in the North Caucasus. But after hearing about the putsch and consulting with Bardin, called his people at the Computation Center. To both teams he insisted on one thing: Keep the line open! Someone at the Computation Center suggested they attempt to print up Yeltsin’s proclamations, but Soldatov was adamant: focus on maintaining the connection—this was vital. Later that day, a guest knocked on the door of the office at the Demos building and said he was a representative of the Yeltsin team. He said he was looking for the commercial offices that had Xerox machines to help them disseminate Yeltsin’s appeals. Bardin told him to forget about Xerox. He explained that they had the computer network connected to all big cities and the West. The Yeltsin man slipped away without another word. Then another Yeltsin envoy appeared at the building and declared authoritatively that they were now all under command of Konstantin Kobets, who had been deputy chief of the Soviet general staff for communications, a Yeltsin supporter, now appointed to lead the resistance. However, Bardin had no idea who Kobets was, and it was the first and last time Bardin heard of Kobets during the three days of the putsch attempt. This second envoy also brought with him some copies of Yeltsin’s statements and asked Bardin to distribute them through the Relcom channels. On the morning of Aug. 20, CNN carried a report that shocked Relcom’s team. A CNN correspondent declared that despite censorship, a large amount of uncensored information was flowing out of the Soviet capital and then showed a computer screen along with the address of the Relcom news group. Bardin and Soldatov believed it was later pulled off the air only because someone in the United States explained to CNN that broadcasting their address could endanger the source of information. The next morning Polina, Vadim Antonov’s wife and also a Demos programmer, wrote to a worried friend, Larry Press, who was professor of computer information systems at California State University. the rest of our life. Polina began to translate the news from the West that Larry sent regularly about the coup for Russians. The decree was broad, intending to shut down all channels of communication in the country, and gave the KGB a role in enforcing it. Bardin, Soldatov, and their programmers, all in their late 20s and 30s, had accomplished significant career breakthroughs in the years of Gorbachev’s revolutionary changes. Each of them knew they owed much of their success to Gorbachev’s glasnost. They were furious that it could all be ruined by a bunch of backward-thinking generals and sclerotic bureaucrats who had locked up Gorbachev in Crimea and were trying to dispose of Yeltsin in Moscow. At the same time, Yeltsin’s people desperately exploited every opportunity to spread the word about resistance to Russian citizens. Vladimir Bulgak served under Yeltsin as the minister of communications for Russia. He had spent his career in radio, starting as a mechanic, and had risen to become chief of the Moscow radio network. In the 1980s, he was put in charge of the finances of the Ministry of Communications and, as a result, saw the underside of the centrally planned economy. Bulgak despised Soviet methods of managing the communications industry. In 1990, he joined Yeltsin’s team. On the day before the coup attempt, Bulgak went on holiday to Yalta, in Crimea. When he saw the coup plotters’ announcement on television, he called Ivan Silaev, Yeltsin’s prime minister, asking what he should do. On Aug. 20, Bulgak was on the first plane to the capital. When he landed, his driver took him from the airport to Yeltsin’s headquarters, bypassing the main roads filled with tanks and troops. There, Bulgak was told that his main objective must be to turn on radio transmitters and broadcast Yeltsin’s proclamation of defiance. “Yeltsin told me to turn on all middle-wave radio transmitters on the European part of Russia,” Bulgak said. These middle-wave transmitters were the main broadcast option in the Soviet Union and, with coverage of 370 miles each, were installed all over the country. It was a difficult task, as all radio transmitters were not under the control of Yeltsin’s government but rather under the control of the Soviet Ministry of Communications, a higher level. “Only three people in the Union’s Ministry knew the passwords, and without a password, a chief of a transmitter never turns on his station,” Bulgak said. He was able to get the passwords from a personal friend. Then, through his own contacts, Bulgak managed to get a mobile radio transmitter on a truck to be driven from Noginsk, 37 miles from Moscow, right to the courtyard where Yeltsin was holed up. It was immediately turned on: In case all else failed, they could at least broadcast Yeltsin’s appeal to the center of the Russian capital. However, the electronic warfare’s detachments were urgently deployed in the southwestern district of Moscow to jam the broadcast of Bulgak’s mobile station. Bulgak worked feverishly through the night, using his personal contacts inside the union’s ministry. By the morning of Aug. 21, the transmitters were turned on. When Yeltsin walked down the steps of the White House, he spoke into a microphone that was directly connected to Bulgak’s activated transmitters. The people at the Soviet Union Ministry of Communications were stunned. As Bulgak got Yeltsin his transmitters, Relcom went further. On the first day of the coup someone in Bardin’s team came up with an idea they called Regime N1: to ask all subscribers of Relcom to look out the window and write back exactly what they saw—just the facts, no emotions. Soon Relcom received a picture of what was happening throughout the country, disseminating the eyewitness reports from subscribers along with news reports. It became clear that the tanks and troops were present only in two cities—Moscow and Leningrad—and the coup would not succeed. The coup attempt collapsed on Aug. 21. Overall, during the three days, Relcom transmitted 46,000 “news units” throughout the Soviet Union and around the world. Regime No. 1 was a revolutionary idea, although not everyone realized it. Radio transmitters spread information in one direction, outward. But Relcom worked in both directions, spreading and collecting information. It was a horizontal structure, a network, a powerful new concept in a country that had been ruled by a rigid, controlling clique. In the 1950s, the first Soviet photocopy machine had been wrecked because it threatened to spread information beyond the control of those who ruled. Now the power of those rulers was being smashed—by a network they could not control. Another principle was also demonstrated during the coup: The programmers did what they thought was right and did not ask permission. They acted because the free flow of information was threatened. They also knew that they had the support of thousands of subscribers, making the network stronger. The very first time the internet had a role in Russian politics was during the three days in August 1991, and back then it helped to crush the security services’ operation by undermining Kremlin’s monopoly on spreading and sharing information. This is not something the Kremlin is ready to tolerate these days. Since 2011, Vladimir Putin’s associates have been busy trying to put the internet under control, using filtering and censorship, surveillance, and direct pressure on domestic and global platforms. This very week the Russian Communications ministry made known their plans to nationalize the crucial elements of the country internet infrastructure, including internet exchange points. The officials also plan to hand over the distribution of domain names to the government. What the Kremlin always seems to miss is that the internet is horizontal—it’s about crowds. In 1991 the crowds shared information about troops movements, using USEnet and emails. These days they use social media, but essentially it’s about the same thing: the content generated by users without any authorization.